If this is anything like a Bloomin’ Onion (and I have a wittle bitty feeling that it is), this won’t last long on any table or countertop! I make these and everyone loves them!! Looks awesome! I can’t get the actual recipe page to open up correctly. Everything is jumbled together and i can’t see the recipe. Any chance anyone could email it to me? [email protected] THANKS! Hope this helps DPMT…and hope it was okay that I posted this from the link. Cut the bread lengthwise and widthwise without cutting through the bottom crust. This can be a little tricky going the second way but the bread is very forgiving. 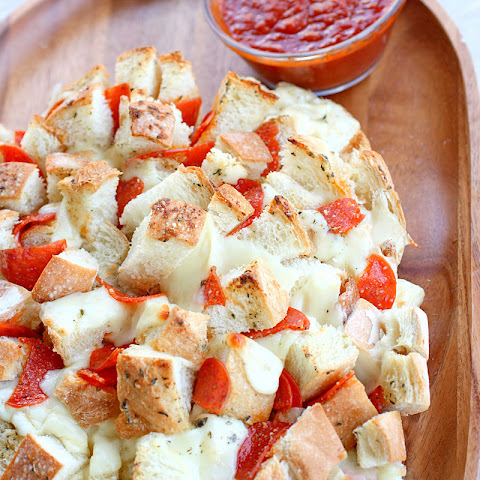 Place bread on a foil-lined baking sheet and insert cheese slices and pepperoni between cuts. Combine butter, garlic powder, and Italian seasonings. Drizzle or brush over bread with a pastry brush. Sprinkle bread with Parmesan cheese. Wrap bread completely in foil and bake at 350 degrees for 15 minutes. Unwrap the bread and bake 10 more minutes, or until cheese is melted and pepperoni is a little crispy.